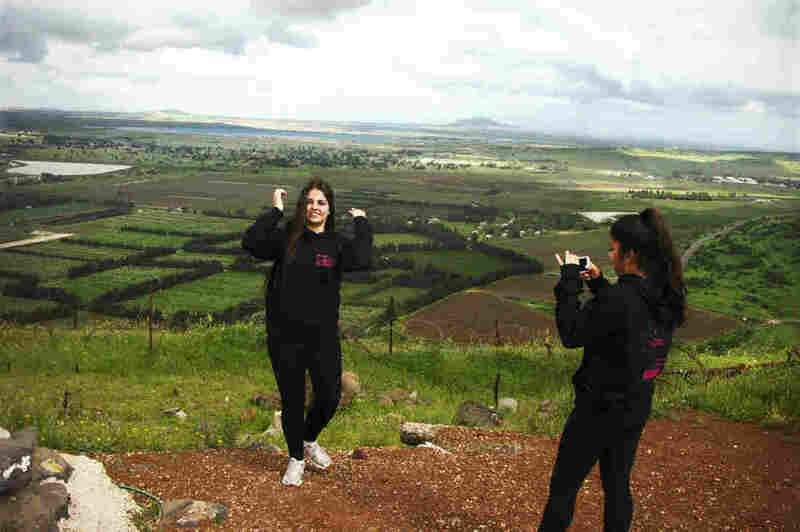 Israeli students snap photos of the Syrian landscape from Mount Bental in the Golan Heights, which is occupied by Israel. Israelis have even watched Syrian troop and rebel movements from here. Spring in the Golan Heights is beautiful. The hills are light yellow-green. The scrawny arms of young cherry trees are covered with small blossoms almost all the way back to their thin trunks. Apples, from last season, are ridiculously cheap and starting to soften, but if you put your nose close to a bagful and inhale you'll breathe their fragrance. The views are uncluttered by desert dust. 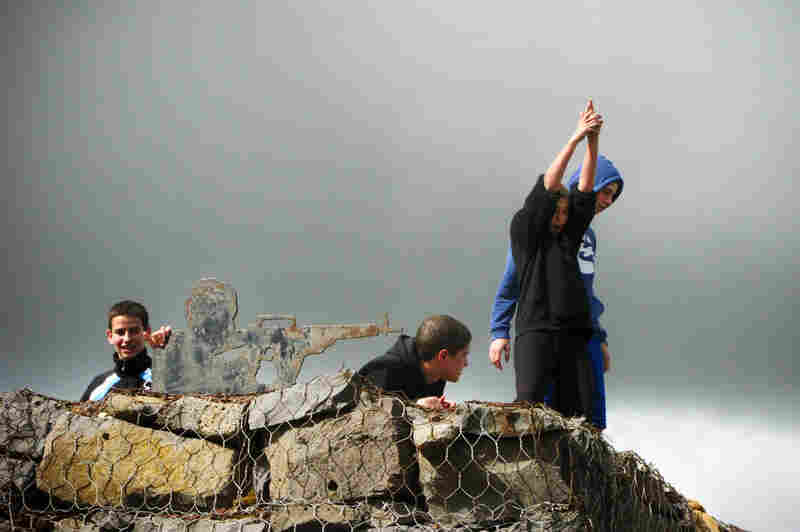 Israeli boys play by metal cutouts of soldiers on the top of Mount Bental, on the Israeli-occupied side of the frontier with Syria. I went to the Golan to see the view of Syria from Israeli-occupied territory. This seems to be a popular pastime. During the hour or so I was at the top of Mount Bental, hundreds of tourists, including school groups and Israeli soldiers in training, climbed around old bunkers and metal cutouts of soldiers in action and snapped photos of the scenery below. You see farms from here, as well as the 10 windmills Israel set up to explore wind energy. Also visible is the old Circassian-built town of Quinetra, which was captured by the Israeli military in the 1967 Six-Day War, recaptured by Syria briefly in the 1973 Arab-Israeli war, and is now, still mostly in ruins, in a demilitarized zone. A new Syrian city with the same name is off in the distance. Low white buildings visible in a different direction house the United Nations force, here since 1974 to observe and enforce the Israel-Syria cease-fire. Most of the time, there hasn't been much to enforce. An enthusiastic audio recording for tourists at the top of Mount Bental declares this "the quietest border Israel has ever known." Israeli officials describe it the same way. 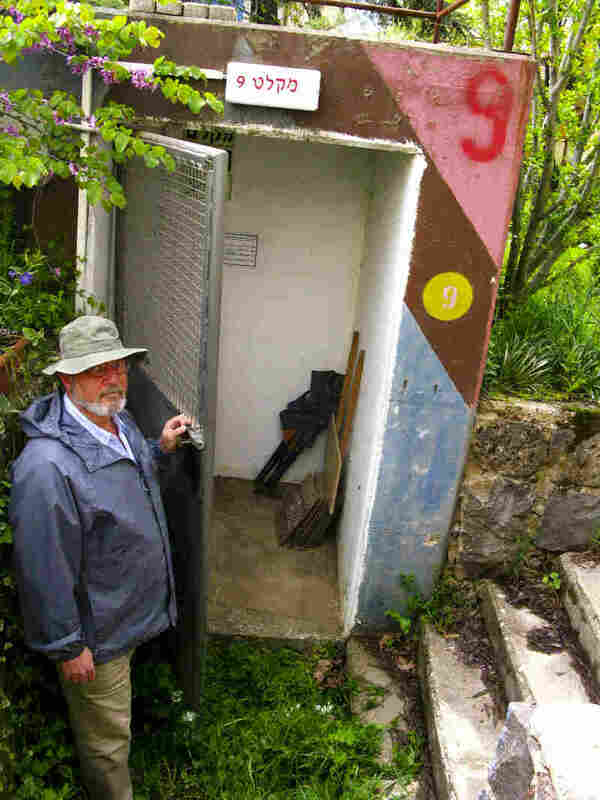 Nadav Katz shows the entrance to a bomb shelter on the kibbutz where he lives in the Israeli-occupied Golan Heights. The war in Syria has kibbutz members double-checking to make sure the shelters are ready to go. It's not an internationally recognized border, but an armistice line. Syria insists on getting the Golan Heights back as part of any peace deal with Israel. Israel, in turn, annexed the Golan Heights in 1981, though the move has never been recognized internationally. Israel says that since the civil war broke out in Syria about two years ago, artillery fired there has landed in Israel more than 10 times. No one has been hurt. Israel has fired back six times, when the military believed shots were not accidentally going astray but targeting Israeli soldiers. Injured people on the Syrian side have also come to the frontier asking for help, in some cases receiving it. Israeli military spokesman Col. Peter Lerner says all of Israel's return fire targeted Syrian army units, which the Israelis believed to be the source aiming at them. But the biggest worry Israelis see as they look at their neighbor in chaos is Islamist extremists among the Syrian rebels. Kobi Marom, a retired Israeli colonel, says it's "just a question of time" before these fighters turn their sights on Israel. He expects that to happen as soon as Syrian President Bashar Assad falls, if not before. Marom commanded troops along this line for two years in the 1990s and now lives high in these hills, close to Israel's only ski resort. He takes me to a spot on the armistice line where a new fence Israel started building earlier this year is just steps from the back patio of a home on the Israeli side. The fence is 30 feet tall and topped with barbed wire. There is an open area next to it on the Israeli side, then a paved road, then another, lower fence. Two years ago, a group of Palestinian refugees living in Syria came to this spot to protest against Israel. Several hundred broke through an old fence — much lower than this new one. At least four people were killed when Israeli troops opened fire. The demonstration, coordinated with other Palestinian protests elsewhere, wasn't a spillover of Syria's civil war, and it wasn't viewed here as a direct a flare-up of the long-quiet Syrian-Israeli conflict. Still, Israel saw it as a warning. "It was like a wake-up call," says Lerner, "saying your border isn't capable to prevent even this type of demonstration of people coming in throwing stones. What will happen if they come with armored personnel carriers?" That is a big if. But Israel doesn't dismiss risks lightly. In recent months reserve Israeli soldiers in the Golan have been replaced with professional troops, now always on alert. There is some concern the U.N. troops might pull out because of risks they face. Twenty-one Filipinos serving in the observer force were briefly kidnapped by Syrian rebels last month. And while on the Israeli side life generally goes on as usual, there is a sense of heightened concern that shows up in small ways. One example is a task local resident Nadav Katz has added to his spring cleaning this year: make sure the bomb shelters on the kibbutz where he lives are clear, clean and ready for anything.